If you plan on visiting New Zealand or Australia, there is no better way to take advantage of your trip than to rent a campervan hire and travel around to the beautiful destinations that this area of the world is famous for. There are so many different advantages to traveling in a camper, from being able to spend the night anywhere you would like, near beautiful natural places such as Fox Glacier or near cities like Melbourne, to having everything you need with you and being able to cook your meals in your camper. You will have less burners. Perhaps you are accustomed to cooking fancy meals with a number of pots and pans on the burners during the process. 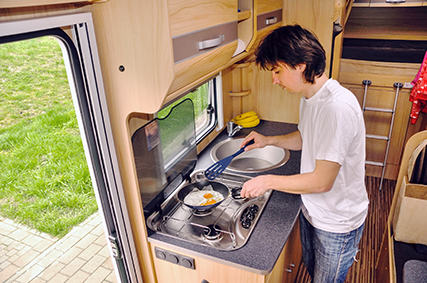 Most campervans will not have that much space for you to cook or burners for more than just one or two pots. So try to plan your meals ahead of time to ensure that you can cook a delicious meal with less fire. Make sure to turn it off. It may be one thing to leave a burner on when you are cooking at home, but it is another thing to forget the burner in a small campervan where you may be using a propane tank for using the stove. A burner left on overnight or worse yet, when you set out on the road is a dangerous component of campervan cooking, so make sure that you always turn the burners off. Check the tank regularly. Apart from always making sure that the burners are turned off, always make sure to check the propane tank to avoid leaks, and also to make sure that everything is in good working order before you drive away. Bring a fire extinguisher. While you will hopefully never need to use it, one of the wisest moves that you can make when you plan on road tripping in a campervan is to bring a fire extinguisher. While cooking in your campervan should be a drama-free experience, should a fire erupt, a fire extinguisher can not only save your camper, but also your life. Secure food in cabinets. Flying food while you are on the open road can be just as dangerous as say, a burner left lit, so make sure that you secure all of the food that you have kept away in cabinets. Just imagine hitting a bump and that 50-year old bottle of wine that you saved for a special occasion flies out and hits your head. Not only will you lose that great bottle of wine, but you may also lose a few screws up there. Make sure your refrigerator is cool enough to preserve food. Food poisoning is no fun and if you aren’t careful with your fridge settings, this could spell out disaster. Just imagine being sick while on your road trip and you will automatically turn down the temperature to ensure your food doesn’t go bad.